Today was supposed to be a tutorial day but my Whimseybox arrived! Well technically it arrived yesterday literally a minute before I had to walk out the door to work. I went my whole shift feeling this anxious, excited energy and I could not wait any longer! Now the unboxing. Also, all of the opinons here are my own and I was not compensated in any way for this review.You guys get a small perk though! If you follow the link below you get $5 off your first box. 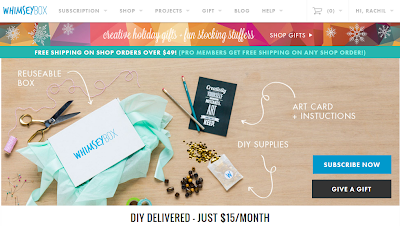 Whimseybox is a craft supply subscription box company. Every month they ship an adorable box of crafty goodness and inspiration to your door. Subscription is only $15 a month and that includes shipping for the US. Whimseybox also has a great blog/site/shop where they post inspiration, their projects, and some of the best craft supplies available. There is also a great DIY community there where anyone can post any DIY projects they've done. You can sign up for one month at a time or go big and choose from 3-month, 6-month and 12-month options. Choosing one of the long-term plans makes you a Pro-member and you receive benefits such as color options in boxes, free shipping from the shop, and more to come! 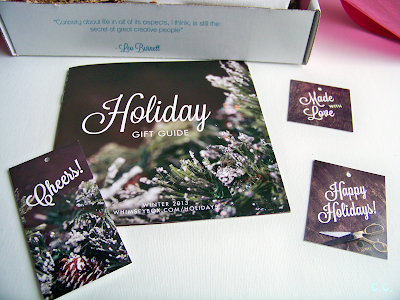 I signed up for the Whimseybox beta the minute I heard about it because it was pretty much the most amazing thing I had ever heard of! They we're flooded with applications though and by the time I had been accepted I had done more research and found out that like most new projects Whimseybox had some bugs. I decided not to sign up and instead just watched their development. Now almost two years later I decided that I could give it a try and treat myself for my birthday. Especially since they posted a $5 off coupon while I was trying to decide. 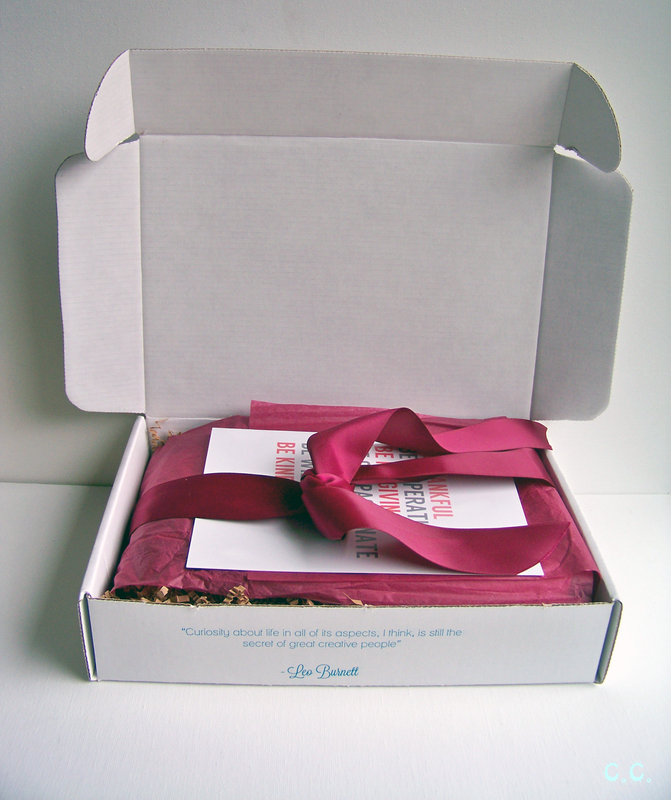 I know everyone comments on this about Whimseybox, but their packaging/presentation is beautiful. This is a relatively new feature, a nice inspirational quote printed on the front of each box. 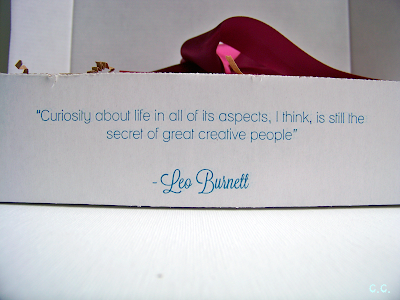 I'm not sure who Leo Burnett is but I agree with him wholeheartedly. Each month there is a collectable art print, this was pretty much the least interesting thing in this months box. I'm not a big typography fan, but I do like the color scheme. I was ecstatic! 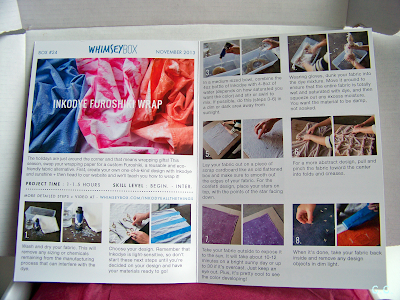 I saw an Inkodye project posted by Whimseybox earlier in the month and was crossing my fingers when I signed up that they might include that in the box. I am so happy I was right! 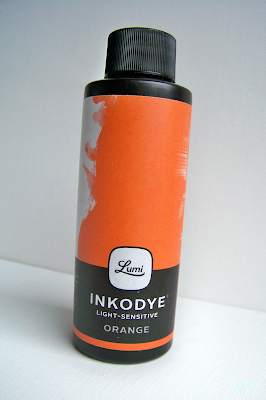 Basically its a dye that "develops" when exposed to sunlight. Which reminded me of my photography days and making photograms in the dark room. You can use it to make really striking subtraction patterns on most natural materials. 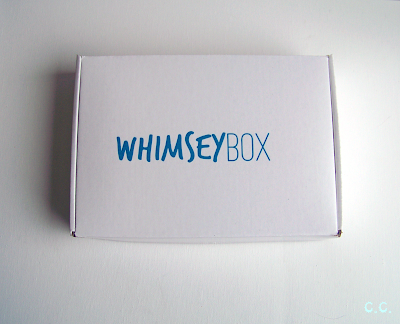 Whimseybox is running some great sales for Christmas in their shop. I love the rustic look of the tags they sent. The art print is the front of the instructions for the project you could make with the materials from the box, but I already have a few ideas for what I want to make with my Inkodye. Overall I am very happy with my Whimseybox experience! If I wasn't currently saving up for my apartment fund I would probably become a permanent subscriber. Maybe I'll be lucky and someone will buy me a pro-membership for Christmas! If you've been on the fence about Whimseybox like I was I would say take the plunge, at least for a month! Its really fun to get that surprise on your front porch and its a good price for the experience I think. What about you? 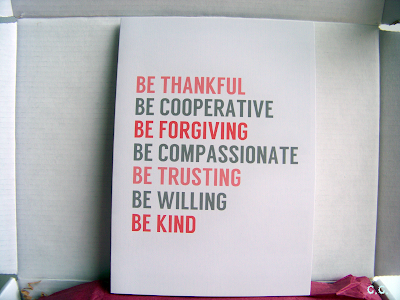 Will you try Whimseybox? Do you want to? What if I sweeten the deal more with this $5 off coupon they made available for my readers because I reviewed them? Click here. Be honest, can you really resist now? Thanks for the link for my readers, how can they possibly resist now?